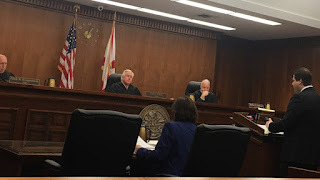 Last year, then-Palm Beach County Chief Judge Jeffrey Colbath handed down guardianship reforms, many of which targeted specific actions by Savitt — such as the taking thousands of dollars in fees prior to judicial approval. Savitt is married to former Circuit Court Judge Martin Colin. “The reason why we find ourselves in this Byzantine muck, if you will, is because there is no clear strategy on who is ultimately responsible for that dignity of the ward or the preservation of the decedent’s estate,” said Judge Cory Ciklin of the 4th District Court of Appeal at a Tuesday hearing on the Savitt guardianship of Frances Berkowitz. Ciklin’s comments during a hearing Tuesday morning were even more remarkable considering the law firm of his brother Alan — Ciklin, Lubitz & O’Connell — recently got hit with a $16.4 million verdict for running up fees in a guardianship in front of Colin. That federal case has since settled for a confidential amount to avoid a lengthy and expensive appellate process. But the troubled guardianship of Frances Berkowitz, a state case, is on appeal. The Palm Beach Post’s award-winning investigative series, Guardianship: A Broken Trust, outlined the vast conflict of interest for Judge Colin as a sitting guardianship judge while his wife practiced as a guardian. He was removed from overseeing guardianship proceedings and announced his retirement. The series also reported numerous complaints from families of Savitt’s wards and forced her cases to be moved. Colbath then announced his reforms. The issue litigated Tuesday at the 4th DCA centered on whether a lawyer who sought a guardianship to protect his client, Berkowitz, could challenge Savitt for her actions and get her removed. Boca Raton attorney Webb Millsaps claimed in court documents that Savitt squandered Berkowitz’s opportunity to recover as much as $1 million from a bank and a Miami lawyer who assisted a caregiver in defrauding Berkowitz of her life savings. The senior died on Dec. 31 at age 86. Palm Beach County Circuit Judge Howard Coates last year ruled Millsaps and his colleague, Donna Greenspan Solomon, had only limited standing to challenge Savitt. Coates ended up dismissing Millsaps’ only surviving claim that Savitt’s appointment was invalid and may have been influenced by Judge Colin. Millsaps also argued that Savitt failed to account for $400,000 missing from Berkowitz’s bank accounts. Instead, the former tennis pro turned guardian entered into a settlement that let the bank and other parties off the hook and instead used what was left of Berkowitz’s money to sue Millsaps and Solomon for the fees they took in collecting more than $800,000 from the caregiver. Solomon, representing Millsaps on Tuesday, told the appellate panel the settlement Savitt made with the bank and caregiver never was formally approved by any court. Solomon told the appellate panel — which included Judge Mark Klingensmith and Associate Judge Mark Belanger — that Savitt paid off a $308,000 foreclosure judgment on a home she owned shortly after receiving her appointment in December 2014. Savitt’s attorney previously told The Palm Beach Post that documentation was provided to the Clerk of Court & Comptroller showing the money used to pay off the foreclosure judgment came from Savitt’s personal accounts. If the appellate court rules in Millsaps’ favor, Solomon said, the decision would allow the Berkowitz heirs to unwind the settlement made by Savitt. The family members have also indicated they plan to sue Savitt. Attorney Roger Levine, arguing on behalf of the guardianship on Tuesday, told the DCA panel that Millsaps, despite being the one who sought guardianship protection for his client, had no standing under the law to challenge Savitt’s decisions. Ciklin also indicated Coates could have acted unilaterally to get to the bottom of Millsaps’ accusations against Savitt.